You can target 1 FIRE monster in your opponent’s GY; Special Summon it to your zone this card points to. If this Link Summoned card is destroyed by battle, or destroyed by an opponent’s card effect while in its owner's Monster Zone: You can add 1 FIRE monster with 1500 or less DEF from your Deck to your hand. You can only use each effect of "Hiita the Fire Charmer, Ablaze" once per turn. 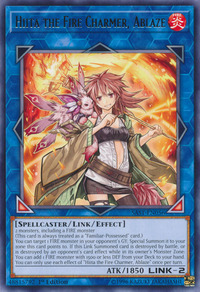 This card is the Link counterpart of Hiita the Fire Charmer. Familiar-Possessed - Hiita, another version of Hiita, has an identical attack to this card. This is the first Charmer Link monster, but not likely to remain the only one. Hiitas familiar is no longer Fox Fire, but a completely different creature, suggesting that other Charmer Link Monsters' familiars won't be the same as their original forms' familiars.